In the words of Ferris Bueller – “Life moves pretty fast. If you don’t stop and look around once in a while, you could miss it”. Ditch work, ditch school – nature’s calling. Camping gear packed, trailer attached and two cars filled – including 4 excited kids below the age of 6! Some may call it brave, others may call it crazy. Off we were to visit the Kgalagadi Transfrontier Park (formerly known as the Kalahari Gemsbok National Park). This is a large wildlife conservation area which borders Namibia and is spread between Botswana and South Africa. It is a dry and sandy landscape and lives up to its name, “place of thirst” (Kgalagadi). Snacking-sticking-looming-singing-sleeping….the road is long! But – Rome wasn’t built in a day and good things come to those who wait. The kids were mesmerised by the majestic roaring thunder they laid their eyes upon as we beckoned upon the “place of great noise”. Running down the wooden walkways like caged monkeys after the long trip they released all the energy they had stored up during the car journey. The older kids, armed with their small digital cameras ran to encircle and capture the unique and peculiar-looking Quiver tree on camera. As they ran on the boardwalk and climbed over the rocks they spotted the many bright and colourful flat lizards, known as the Broadley. Our eldest boy sharing his knowledge on the difference between the brightly coloured males and the dull grey female lizards. The kids loved to challenge themselves creeping up as close as they can to the cold-blooded reptilians warming their skins under the African sun. 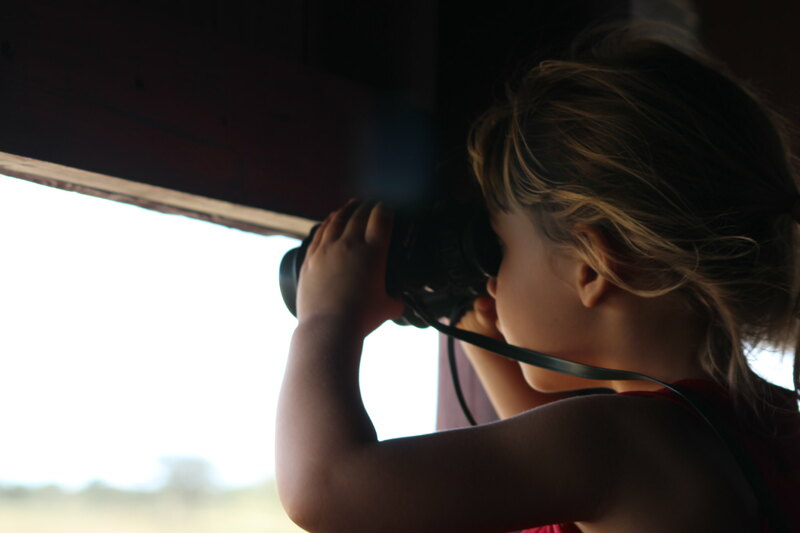 The kids learnt about the shy nature of wildlife quickly and that you need to be very quiet and very still – not an easy task for a child under the age of 6! In the heat of the day, nothing more pleasant than a dip in the pool to cool the body and wash the sand that cakes onto one’s skin. The path to the pool at the campsite takes the kids through a large group of Dassies. The kids, armed with excitement, enjoy watching the Dassies as they climb through the bushes and run across the grass before their feet. Another day – another drive. The energy-charged kids jump out of the car and lie flat in the sand beneath their feet in Twee Rivieren. Making sand-angels with their arms and legs the children take in this new part of the earth that they are experiencing. Shortly after, they are in the bushes walking among Cape ground squirrels. Every now and again they squeal with excitement as one pops its head out of his home in the sand to say hello. From the top of the hill, we watch the sunset and do cartwheels in the dusk before returning to light the fire. The kids throw popcorn kernels in the fire and laugh as they listen to the popping sounds they make in the flames. The wild becomes alive as the cover of darkness hits. A large owl sits in a tree above us waiting for his hunt to begin. We sleep very little as we are roused every so often by the lions roaring some distance from us. Dawn approaches and as we pack the car the kids watch the birds who hop around and peck at the braai grid in the hope of savouring some left-over flavours of the night before. In the car, the kids have a competition to mark off who can find the most wildlife. We tick off the giraffe’s, gemsbok, jackals and birds as we drive the dirt road to the inner part of the national park – Mata Mata. About half-way we are forced to a sudden stop as we spot a hyena and her cub feasting on the remains of what we assume is a lion kill. It looks like the hyena’s den. A shout from one of the kids alerts us that the hyena has company. It’s a sneaky jackal who intends to share the hyena’s feast with her. We watch the goings-on and the kids tell stories about what they think may have happened. They are learning about cause and effect, about the laws of nature and about using their imagination. Perhaps the hyena brought the kill to feed her cub at this den. Perhaps the kill took place here and the hyena and jackal stumbled upon it. Or perhaps the hyena and the jackal are friends? The children’s imaginations danced with ideas and sparkled with creativity. With their resistance, we finally managed to drive away from this wildlife documentary that was playing live before our eyes. Arriving in Mata-Mata, luck is our friend and we establish camp right along the fence that divides the campsite from a large open plain. The yellow mongoose stands on his hind legs and watches us with intrigue as we set up camp. Armed with ice creams from the campsite shop and on the way to the pool to cool down, we stop to watch the families of meerkats as they tumble and play with one another in the sand. As darkness approaches, we light the fire and the kids pack away their marble games and cars, leaving their tracks in the sand for the following morning. The waters run brown as we wash the Kalahari sand off their bodies. With their headlamps on, the adventures begin in the lit up tent before bed. We sleep a second night with the humming sounds of the lioness as she roars close by over the hill. A little while later there is a noise and we all zip open our tents to explore in anticipation. There she is – walking just a few metres away from us behind the fence along the plain. We watch her as she moves in the direction of what we later learn are her cubs. She is hunting and the next day we discover there is a lion den nearby with a number of lion cubs. In the early morning, we are lucky enough to sit watching the lion cub as he climbs playfully over daddy’s mane at the top of the hill before a backdrop on the rising sun. 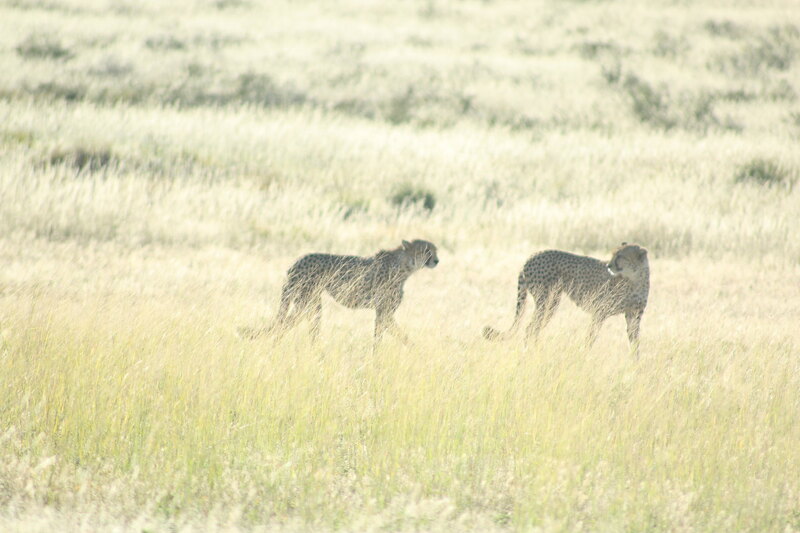 Our early morning drive takes us past a family of adolescent cheetahs. We travel with them several hundred metres as they stroll along on their way to some unknown destination. They watch us as we watch them, time almost comes to a standstill as we share this moment until eventually they are out of sight and it seems like a dream. 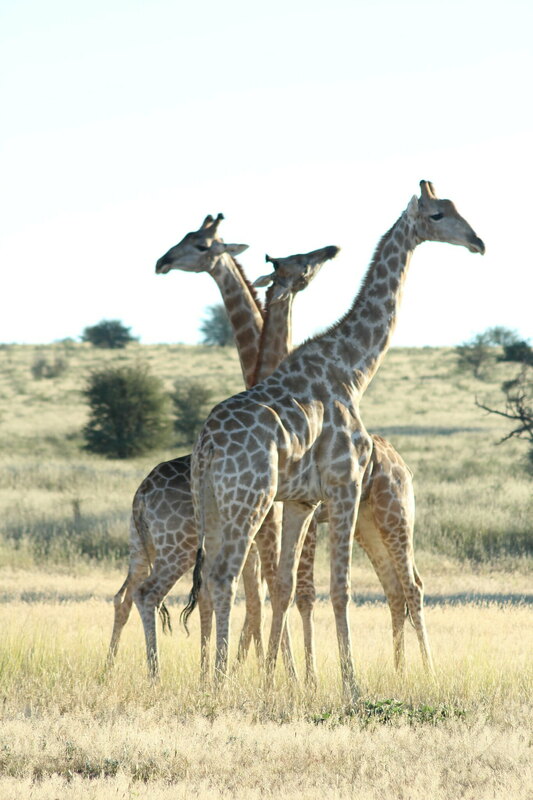 We stop to observe the giraffes inter-twining their long golden necks with one another like Rapunzel plaiting her hair, then enjoy a show by the Wildebeests as they play ‘catch’. Cuddling in the car with blankets over us and enjoying rusks dipped in warm drinks, the kids are calm and captivated by the show that is presented to them. Travelling towards Nossob, we spot two lazy black-maned lions laying in the heat of the day between the long dry grass under the welcome shade of a tree. A honey badger runs across the road and we just manage to catch a glimpse of him before he is out of sight. At camp, we set up for the night and the adventures begin as we discover the ‘hide’. This becomes the children’s new TV, with shows changing every half hour. Regular trips between the tent and the hide kept them busy as they anticipated what show would be on next. With some fighting over the binoculars and lots of ‘shhhhhh’ they eventually learnt the etiquette of ‘hide’-ing. Our eyes welcomed the sight of a cheetah who sat up in the grass watching a Springbok play a dangerous game of cat and mouse, whilst closer, we were graced by the company of a jackal who came to drink from the small watering hole. Up above us, the Martial eagle soars as the sun sets over the plains. 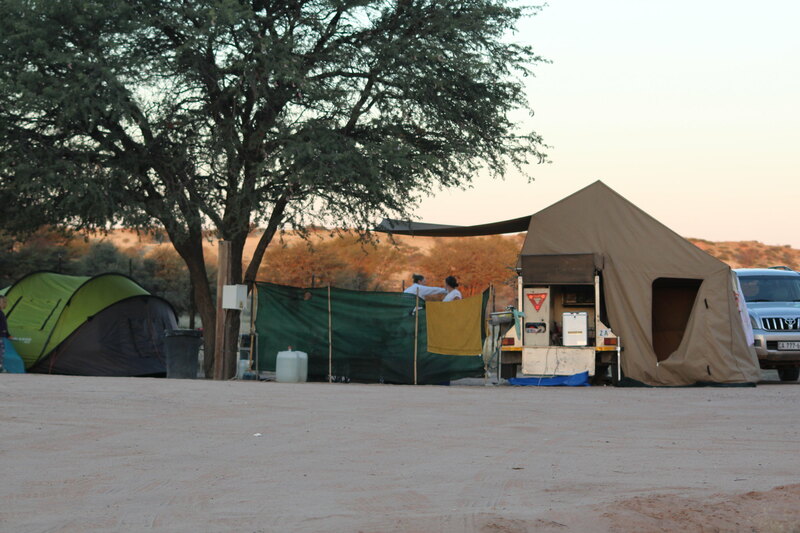 Transport: It’s best you have a 4×4 or a 4×2 vehicle when travelling around the Kgalagadi as many roads can be difficult to navigate without a high clearance vehicle (you can contact www.lekkercamper.co.za or www.britz.co.za for suitable transport or vehicle rentals). Accomodation: available through SANPARKS (www.sanparks.org) but the ultimate experience is camping (which can be as luxurious as you choose to make it). All accommodation in the Kgalagadi is booked at least a year in advance so it’s best to plan well ahead for this unique adventure of a lifetime. Best time to go: The trip can be managed on a budget or you can make it a more luxurious experience. It is a very hot and dry area so travel is much more comfortable just after the rains (between March and May). This is also when you have better wildlife sightings. In the summer the heat is unbearable so best to avoid that time of year. 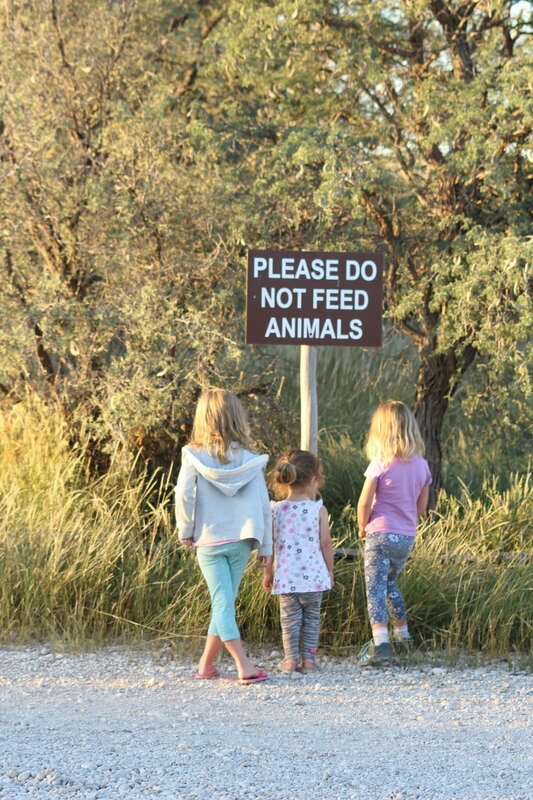 Importantly, Kgalagadi is a Malaria free area and thus can be considered more child-friendly than some other wildlife parks in Africa, however, insect repellent and sun protection are a necessity. Simcha has had the privilege of having lived in rural Belgium, through to wild Zimbabwe, and the metropolis of London before settling for a breath of fresh air in Cape Town. As a working mother and wife, she continues to embrace travel as an important part of her holistic well-being and seeks regular adventures to feed her mind and soul.